Good afternoon. I feel honoured to be invited to address this distinguished and high-powered audience. 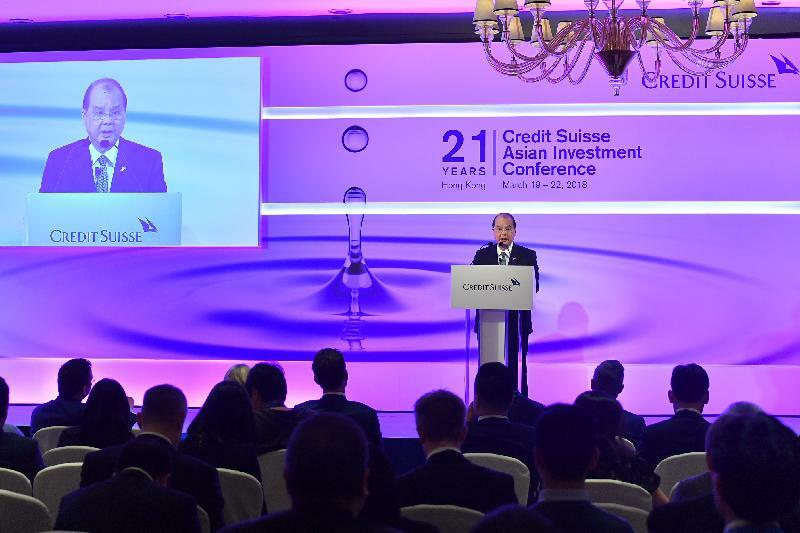 The Credit Suisse Asian Investment Conference offers an excellent platform for prominent political, economic, financial and academic leaders, from Hong Kong and overseas, to share their ideas, thoughts and wisdom on current issues of concern. The title of my speech is "What Makes Hong Kong Tick - and Can Hong Kong Remain Prosperous in the Decades Ahead?". This double-barrelled question must be lingering in the minds of some of you here and many parts of the world. I remember distinctly that similar questions were raised in the lead-up to 1997 when Hong Kong returned to our motherland on 1 July, 1997. There were serious doubts in certain quarters then on whether Hong Kong could continue to survive, let alone thrive as a shining and successful free-enterprise economy after 1997. Some pessimists even wrote us off and predicted that Hong Kong was doomed to fail after 1997. As you all know, these misgivings have been all proven completely wrong. Twenty-one years on, the Hong Kong Special Administrative Region, which I am serving, under the unique "one country, two systems" framework is not only kicking and well alive but continues to flourish and forge ahead with immense vigour. For those who are anxious to know whether Hong Kong would remain prosperous and successful in the decades ahead, let me hasten to put their minds at ease. Whilst there are indeed challenges confronting Hong Kong on the horizon, there are far more opportunities ahead for Hong Kong. In short, the pluses far outweigh the minuses. I have no doubt that Hong Kong will continue to be a vibrant, open and diverse international centre of finance, business, trade, transportation, tourism and professional services in the decades ahead. We will remain Asia's world city and the Pearl of the Orient. Let us look at some essential facts and figures. They speak volumes about Hong Kong's inherent strengths and core values which form the cornerstones of our present-day and long-term success. First is our strategic geographical location. Lying at the heart of Asia, Hong Kong is a springboard into Mainland China as well as the entire Asia and Asia-Pacific region, which are the world's fastest growing and largest market. Hong Kong is well known for its world-class transport and information technology infrastructures and highly efficient logistics network. Our airport has been ranked first internationally in air cargo throughput for eight consecutive years. Our container port is one of the world's busiest with an average of 11 hours to load and unload a full container vessel. We are very well connected in the region, reaching half of the world's population within five hours' flight time. We are also the world's most penetrated digital economy, with secure cyber connection and seamless broadband services. We are also home to the highest number of international companies using Hong Kong as their regional headquarters and offices, not to mention the presence of the international community with multinational, multi-ethnic and multicultural diversity. We pride ourselves on our business-friendly environment. Our low and simple tax regime and free flow of information, capital and people plus a diversified talent pool have added to our appeal as a first-class business city. Little wonder, therefore, that Hong Kong continues to be ranked as the world's freest economy for the 24th consecutive year by the Washington-based Heritage Foundation. We also captured the title as the world's most competitive economy in the World Competitiveness Yearbook 2017 released by the International Institute of Management Development. Underpinning Hong Kong's long-term success are our core values. These include the rule of law, a fiercely independent judiciary, a robust legal aid system ensuring access to justice, as well as freedom and rights guaranteed under the Basic Law, our mini-constitution. We have a clean administration and a highly efficient, professional and reliable public service. I should point out that our judicial system has gained worldwide recognition. In fact, the Basic Law does provide for eminent foreign judges to sit on our Court of Final Appeal as non-permanent judges. We have had, in fact, a number of illustrious judges from the United Kingdom and Australia coming here since 1997 for this very purpose. To all intents and purposes, this is a unique arrangement and is totally unparalleled in any other jurisdiction in the world. It also underlines the absolute independence and transparency of our judiciary. Hong Kong is also one of the safest cities in the world. A recent international independent study ranks this dynamic place as the fourth safest city in the world. Last year, our crime rate dropped dramatically to a 46-year low since 1972. On the softer side, we have a high-quality tertiary education system. Of the eight universities funded by the Government, through the University Grant Committee, five are among the world's top 100. The world's number one and number two Executive MBA (Master of Business Administration) programmes are offered in Hong Kong, with the Hong Kong University Science and Technology topping the list of the world, followed by the University of Hong Kong. What is more, the world's best dental faculty is at the University of Hong Kong. To crown all, Hong Kong enjoys unique dual advantages under the innovative and visionary "one country, two systems" principle. We are part of China whilst retaining our own economic, legal and social systems and way of life. We are China's most open, international, well-connected and vibrant financial metropolis. We are also the world's largest offshore Renminbi (RMB) centre. Let me now move on to the bigger regional picture. The shift in global economic gravity from the West to the East has been abundantly clear. Over the past five years, China has contributed over 30 per cent to global economic growth and, together with other developing regions in Asia, has made up a share of almost 60 per cent. In the foreseeable future, the developing regions in Asia will continue to drive the global economy. Since the reform and opening up of our country exactly 40 years ago, China's economy grew by about 9.5 per cent per annum in real terms on average and has risen to a US$12 trillion economy last year. Its per capita GDP also increased from just over US$200 in 1978 to over US$8,000 today. The future directions and strategies of our motherland's economic development thus have a major global bearing. China obviously has come to the world stage by joining the global trade market. And there are increasing signs that the Association of Southeast Asian Nations (ASEAN) as a group is in fact following the footprint of China by opening up more. This is the reason why Hong Kong needs to strengthen our ties by way of a free trade agreement with ASEAN signed last December. To sustain our competitiveness, Hong Kong needs to consolidate and enhance our strengths and take a forward-looking and visionary approach to position our future development and seek new impetus. And here I am referring to the bountiful new opportunities brought by the new developments under the national Belt and Road Initiative and the development of the Guangdong-Hong Kong-Macao Bay Area in which we will play an active and important role. They will be the linchpin of Hong Kong's continuous prosperity. The Belt and Road Initiative proposed by President Xi Jinping offers what the global economy needs in the 21st century - a way forward that we can all embrace, and a future built on co-operation, mutual benefits and friendship. It is an ambitious plan seeking to promote economic and social co-operation among countries and regions that span across Asia, Europe and Africa. It strategically guides the long-term national development and is clearly the driving engine of the regional and even global economy. At present, more than 270 agreements or deliverables have been entered into among the economies along the Belt and Road corridors. These agreements and projects are cross-border with extensive coverage, ranging from finance, infrastructure, trade and commerce, information technology and digital development to agriculture, poverty alleviation, healthcare, environmental protection and conservation. According to the Asian Development Bank, it is estimated that Asia will require an infrastructure investment of US$1.7 trillion per year until 2030. The trade volume of the region amounted to US$10.9 trillion in 2016. President Xi Jinping stated at the 19th National Congress of the Communist Party of China that the Belt and Road Initiative should be pursued as a priority and be given equal emphasis to "bringing in" and "going global", with a view to breaking new ground in opening China further through links running eastward and westward, across land and over sea. Speaking at the World Economic Forum last year, President Xi said that China is expected to import US$8 trillion of goods, attract US$600 billion of foreign investment and make US$750 billion of outbound investment in a five-year period. Chinese tourists would make 700 million overseas visits. All these will create a bigger market, more capital, more products and more business opportunities, and certainly broader use of the Renminbi in global trade, investment and foreign reserves. Hong Kong is destined to play an important role in the development of the Belt and Road Initiative. As a highly open economy with extensive connections and international experience, Hong Kong is the freest market, allowing free flow of trade, capital, goods, talent and information while keeping close ties with our motherland. In December last year, we signed the "Arrangement between the National Development and Reform Commission and the Government of the Hong Kong Special Administrative Region for Advancing Hong Kong's Full Participation in and Contribution to the Belt and Road Initiative". The Arrangement will allow Hong Kong to give full play to our unique advantages under "one country, two systems" to contribute to our country and, at the same time, seize the opportunities brought by the Initiative to give new impetus for our economic growth. The relevant measures will help reinforce and elevate Hong Kong's position as an international financial, transport and trade centre, promote partnership between Mainland and Hong Kong enterprises, spawn the demand for Hong Kong's professional services and present our home-grown talents with promising prospects, therefore enhancing the upward mobility of our younger generations. As a member of the Asian Infrastructure Investment Bank (AIIB), Hong Kong has been collaborating with AIIB and other financial institutions around the world to facilitate infrastructure financing along the Belt and Road. The Hong Kong Monetary Authority's Infrastructure Financing Facilitation Office (IFFO) has brought together more than 87 partners from the investment and financial sectors worldwide to join hands in the development. Infrastructure development and industrial diversification require enormous investment. In April last year, our Securities and Futures Commission set out the eligibility criteria for infrastructure project companies to list on our stock exchange. These criteria provide a clear pathway for Belt and Road projects looking to Hong Kong for equity and debt financing. With free flow of capital and a deep pool of financial talent, Hong Kong is the ideal place to raise funds for Belt and Road projects. We have a wealth of experience and expertise plus good reputation in carrying out project finance in both public and private markets and a great variety of financing avenues. The Hong Kong Stock Exchange has ranked among the world's top five in initial public offerings (IPOs) over the past 16 years. The funds raised through IPOs in 2017 amounted to US$16.5 billion. We are, of course, also the largest offshore Renminbi business hub in the world, with a pool of RMB618 billion by the end of 2017, handling around 76 per cent of global RMB transactions. We are committed to developing our bond market, Fintech, green finance and manpower training and other aspects of financial services. To this end, we have earmarked HK$500 million for the development of the financial services industry in the next five years. Alongside our expertise in financial services, we have a deep pool of multi-discipline and multicultural talent across different sectors - in law (and particularly arbitration services), accounting, engineering, architecture, management and consulting. Our world-class professionals stand ready to participate in and lead the big ticket of the Belt and Road projects. As a matter of fact, Hong Kong enterprises and professionals are already participating in quite a number of projects in regions along the Belt and Road. Notable examples include the metro system in Saudi Arabia, airports in Cambodia and Sri Lanka, power plants in Thailand and Vietnam as well as a waste management system in Bangladesh. Incidentally, as an aside, the Hong Kong MTR Corporation is operating part of the rail service in Melbourne, Stockholm, Shenzhen, Shanghai and Beijing and Cross Rail in London. This testifies to our world-class professional and project management capabilities. Let me turn to the Bay Area development, which was first detailed by Premier Li Keqiang in his Government Work Report in March last year, and is a key pillar for the Belt and Road Initiative. With a population of 66 million, roughly the size of the United Kingdom, and a collective GDP of US$1.4 trillion, akin to that of South Korea or Australia, the economic potential that could be unleashed from increased connectivity and integration within the Bay Area is beyond imagination. Its air- and sea-cargo throughput leads the whole world, presenting a central passageway for air, land and sea transport linking countries along the Belt and Road. Hong Kong is a vital and indispensable part of the Bay Area development. As the gateway for Mainland business to "go global" and the host for over 8 200 foreign and Mainland companies, we are best positioned within the Bay Area to play the key role in turning the vision of the Belt and Road Initiative into real business opportunities. And these opportunities will translate the Bay Area development into tangible benefits for enterprises and professionals of Hong Kong, the Mainland and the world. Last July, we signed the "Framework Agreement on Deepening Guangdong-Hong Kong-Macao Cooperation in the Development of the Bay Area" with the National Development and Reform Commission, Guangdong Province and the Macao Special Administrative Region to kick off the Bay Area development. The State Council will soon promulgate the Development Plan for the Bay Area to provide a blueprint for building a world-class city cluster through complementary co-operation and building synergy among the three places. The Hong Kong Special Administrative Region Government will actively participate in taking forward the development of the Bay Area in order to create favourable conditions for diversifying our industries, particularly for promoting innovation and technology development. To this end, as the Chief Secretary for Administration, I am chairing the Steering Committee on Bay Area Development and Mainland Co-operation to co-ordinate cross-bureau policies within the administration and formulate concrete work plans for Hong Kong to capitalise on our unique and huge advantages in the Bay Area. In addition, our Constitutional and Mainland Affairs Bureau has set up the Guangdong-Hong Kong-Macao Bay Area Development Office to strengthen our co-ordination with the relevant Central Authorities, the Guangdong Provincial Government, the Macao Special Administrative Region Government, and relevant government bureaux and departments, and to proactively approach trade associations, professional bodies and relevant stakeholders to co-ordinate effort related to the implementation of the Development Plan for the Bay Area. Additional resources will also be allocated to the Office for undertaking research and publicity on the Bay Area development to assist Hong Kong people and enterprises in seizing new opportunities. Furthermore, a third runway project for our airport at Chek Lap Kok is well under way and it is expected to be commissioned fully by 2024. The annual passenger volume is expected to increase from 70 million passengers to around 100 million, while cargo volume will be doubled to 9 million tonnes per year. Hong Kong's links with the rest of the world will be substantially enhanced. These mega projects will also strengthen Hong Kong's position as Asia's hyper-connected world city as well as our status as the region's trade, business and logistics hub. Our strengths make us an important hub connecting China to the world as well as the East and the West. Hong Kong can advance the Bay Area to become an innovation centre for the Belt and Road Initiative. Our extensive international market and transport networks will strengthen connection between the Bay Area and global markets. Besides, Hong Kong is well versed in international technological trends and technical standards, and offers an enormous base of highly skilled workers, supported by many well-respected and world-class tertiary institutions. To this end, we are vigorously pursuing a strategy of innovation-driven development, and investing heavily in grooming the next generation of IT talents. We have set the goal of doubling our Gross Domestic Expenditure on research and development as a percentage of the Gross Domestic Product to about HK$45 billion a year, that is, from the current 0.73 per cent to 1.5 per cent by the end of the current Government's five-year term in June 2022. We have also set aside no less than HK$10 billion as funding for university research. To give private companies incentives to increase investment in technological research and development, we will provide super tax deduction for expenditure incurred by enterprises on research and development. The first HK$2 million of eligible research and development expenditure will enjoy a 300 per cent tax deduction and 200 per cent for the remainder. To strengthen our talent pool, we will invest HK$3.5 billion to boost the quality and quantity of local technology talents, including a HK$500 million Technology Talent Scheme and an injection of HK$3 billion into the Research Endowment Fund. To add further impetus to the development of innovation and technology in Hong Kong, we will allocate HK$50 billion for developing innovation in the areas of biotechnology, artificial intelligence, Fintech and building a smart city. Ladies and gentlemen, the current-term Hong Kong Special Administrative Region Government is committed to be a facilitator and promoter in addition to our traditional roles of a service provider and regulator on all fronts, including strengthening links between Hong Kong and the Mainland as well as other countries, elevating our city's status as Asia's world city, attracting Mainland and overseas enterprises and talent to Hong Kong and, in collaboration with relevant organisations and trade representatives, proactively conducting government-to-government interaction dialogue and lobbying. These new roles will certainly apply to our involvement in the Bay Area development and the Belt and Road Initiative. We are determined to seize the opportunities arising from the national Belt and Road Initiative as well as the Bay Area development in order to propel our economy forward. I hope that I have persuaded you that Hong Kong will continue to kick, tick, shine, thrive and pulsate in the decades ahead. Hong Kong is very much an economic miracle and will remain so for a very long time to come. In fact, the best is yet to come. 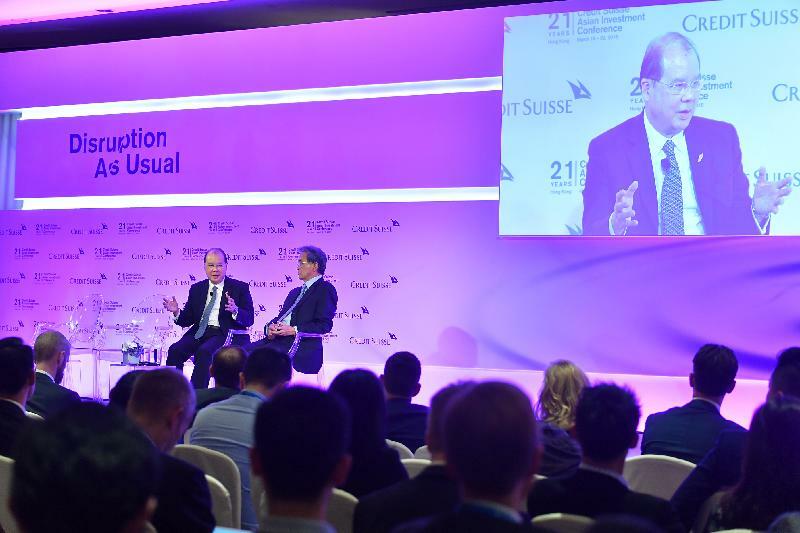 On this well-founded upbeat note, I wish the Conference every success and all overseas visitors and investors a very pleasant and rewarding stay in Hong Kong. Thank you very much for having me.